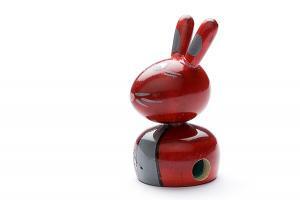 A colourful and cheerful wooden sharpener shaped like a rabbit. This colourful and cheerful red wooden sharpener shaped like a rabbit is a great wooden toy or accessory to sharpen the pencils of your child. With this wooden sharpener sharpening becomes a pleasure! The warm indi colours make this wooden toy even more attractive. This wooden sharpener is hand made and produced out of sustainable natural wood (with an exception for the sharpener itself). This wooden toy also suits perfectly as decoration for your child's room or any desk in need for some decoration, creativity or colours. This wooden sharpener is part of our indi sharpener collection. Make your collection (more) complete with one of the 8 other exciting wooden sharpeners! This wooden sharpener is part of our indi coloured toys series. This series consists of our wooden toys coloured with paint made of vegetable extracts, resulting in warm and beautiful colours. Each wooden sharpener of our indi coloured toys series is individually branded by the natural grains of the wood and the touch of the craftsman.